In an old growth forest on one of the local mountains, huge specimens occur, commonly have trunks more than a meter across. Truly massive trees aren’t necessarily that old, perhaps just a hundred years in some cases. 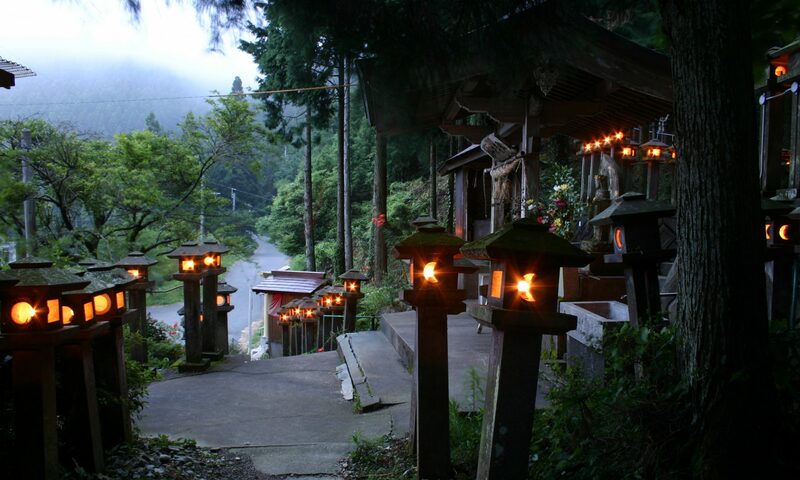 A few temple specimens are thought to be around a 1000 years, but ages are often exaggerated. Today old growth forests containing these trees are a rarity, existing in small patches. This is another iconic Japanese tree, widely grown and beloved, thus it has a strong future in this country. 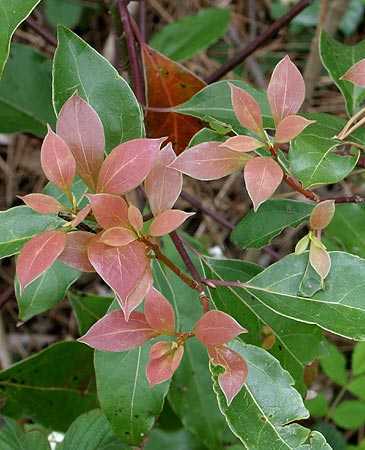 The newly flushed leaves of Cinnamomum camphora are a rich purple-red that turns quickly to brilliant green. 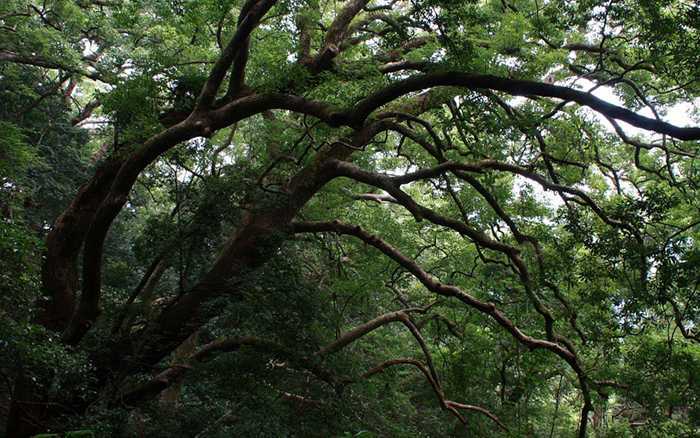 Camphor tree uses are extensive, and although its essential oil was more commonly used in the past, even today it is used in perfumes, insecticides, explosives, deodorants, in Japanese foods (beverages and sweets), in south Asian cuisine, and medicines. Crushed leaves give off a potent camphor smell. Although this oil is potentially toxic, it still can be found in many over the counter creams, lotions, and antiseptics. Camphor wood is used to make furniture, in general carpentry, and as veneers and inlays. It is a favored wood in Asia due to its natural ability to repel insects, and for its lovely grain and color. The historic medicinal uses of camphor include as anti-inflammatories, antiseptics, antimicrobials, anesthetics, anti-flatulents, stimulants, and pain relievers. It is still commonly used in over the counter cooling and anti-itch gels in combination with menthol. Though these topical applications are yet permitted in the U.S., oral medicines were banned in the 80’s, and the FDA has restricted total camphor content to 11%. Current medical opinion is that camphor is useful in relieving coughs when applied as a chest rub, for treating itching and irritation of the skin (bruises, minor burns, insect bites, etc. ), and as pain killer when used as a rub on lotion. There is some evidence of temporary relief of stiff joints from osteoarthritis, again when applied topically as a lotion. There is not enough evidence to support its use in treating toe nail fungus, hemorrhoids, warts, or any other physical ailment. 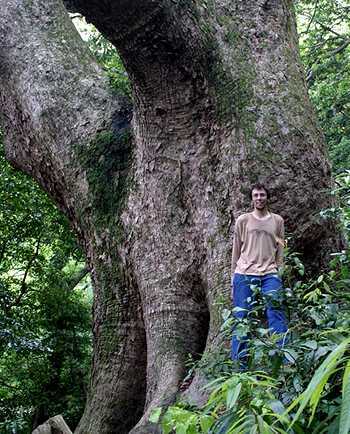 This ancient camphor tree is growing in a old growth forest. Plantsman Rogier van Vugt stands next to this behemoth, himself standing 2 meters tall, attesting to its size. Tachibanayama, Fukuoka Prefecture, Kyushu, Japan. Camphor oil itself a more complex cocktail of chemicals, including camphor, borneol, 1,8-cineole, linalool, nerolidol, and safrole. This last one in particular, safrole, is a known mild carcinogen found also in sassafras, nutmeg, black pepper, and basil. In the U.S. safrole was used as flavor but now is banned by the FDA for that purpose. Much has been written about the different forms of camphor tree based on the proportions of these chemicals, so called chemotypes. Some chemotypes have been considered highly toxic and much literature has been generated about the danger of these trees, though the bulk of that seems to be anecdotal. Sound scientific, peer-reviewed studies are few and inconclusive. In the end, camphor oil probably isn’t that bad, but daily use (particularly orally) is likely to cause problems, and in extreme cases, even death. In the 1800’s camphor trees were planted across the globe in regions as far reaching as the southeastern USA, Hawaii, and Australia. They were brought in originally as ornamental shade trees and also as a source of camphor oil in Australia, but its commercial viability never was realized. In Australia camphor laurels (as they are called there) have become an invasive pest, and today the planting and distribution of this tree is illegal in the states of New South Wales and Queensland. Here they have taken over waterways, dropping large amounts of their pungent leaves into them. Camphor trees also have invaded old pastureland, and are replacing native eucalypt forests. In the southeast USA, particularly in north and central Florida, the tree has become an invasive weed, especially on roadsides, fallow pastures, and disturbed sites. Within the state it is listed as an exotic pest, but is not on state or federal noxious weed lists, so its movement within the USA is not restricted. In Hawaii it is common in some areas, and given the delicate island ecology there it could become yet another exotic threat to those island’s native plants and animals. 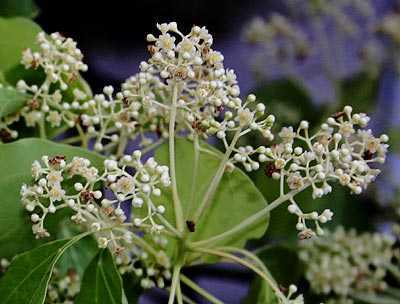 The flowers of Cinnamomum camphora open with the new leaves and are borne in loose clusters. They pollinate readily and produce large amounts of blue-black berries annually. The Latin name, Cinnamomum, is from the Greek word “kinnamomon”, meaning cinnamon since this genus is known for aromatic barks that can be used as a spice, especially C. zeylanicum, the source of cinnamon “sticks”. In the past, C. japonicum was used in Japan as a form of cinnamon as well. The species epithet, camphora, refers to camphor, the famous chemical constituent in the oil found in the tree’s tissues. 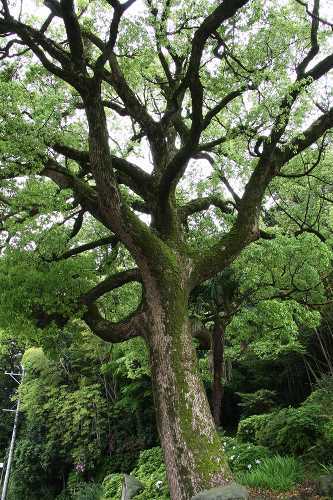 The Japanese name is kusunoki, derived from a single kanji character, and simply meaning “camphor tree”. This is probably the most commonly grown laurel tree in the world. It has been cultivated just about anywhere it can withstand the winters. It seems fully hardy to USDA zone 8b, although cold winter snaps can damage it severely. During the winter of 1985 temperatures in Gainesville, Florida dropped to a record breaking -12 C. I remember two old camphor trees living on the main route through town suffered great damage that year, losing 50% of their crowns. Damage to the smaller branches probably occurs when temperatures drop below -7 C or so. It is rarely grown in yards in Japan due to its huge size, but is frequently seen in parks, on broad avenues, and most especially at temples and shrines. 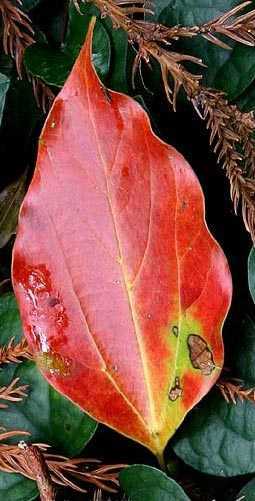 Old leaves are shed soon after the new ones flush in spring and are a lovely orange-red color. It isn’t a demanding tree, although it needs a well draining soil, sun, and not too severe winters. It has been reported to be drought tolerant, which is interesting since in its native range it grows in humid, wet climates. Furthermore, it seems happy in soils ranging from acidic to basic (pH 4-8). Although it is a lovely tree, I would be remiss not to mention the potential invasiveness of this species in warm, wet climates. In Australia it is invasive in the wet northern areas. Likewise, in America it is invasive in the southeastern hardwood forests (in particular Florida), yet is a slow growing and well behaved tree in the warmer areas of the Pacific Northwest, being grown even in south coastal British Columbia. The plant spreads rapidly due to its prodigious seed production with a single mature tree bearing 100,000 or more per season. Birds readily eat these, spreading them far and wide. The upshot is that outside its native range, it needs to be handled with care. If you live in a cool and/or dry climate it may be reasonable to grow this one. On the other hand, if your climate is warm and wet, it is probably irresponsible to grow it. Love it or hate it, the camphor tree is embedded within human culture for the duration. It too has extended its range over much of the world’s wet tropical and subtropical regions. Given its ability to reproduce, it will likely remain naturalized in those areas regardless of efforts to eradicate it. One of the most distinctive features of this species in old age are its arching boughs. 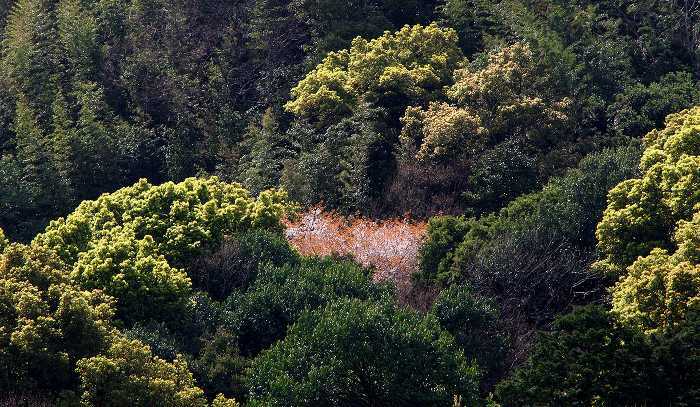 This ancient specimen is growing on the steep slopes of Tachibanayama, Fukuoka Prefecture, Kyushu, Japan. Usually the camphor crystals are well placed inside the Wardrobes to protect clothing from moths. Can you use Camphor wood for barbeque wood. Kassie, In general I would have to recommend against preparing any food with camphor products. As you know, camphor wood contains a range of volatile chemicals, some of which are known carcinogens (safrole), irritants (borneol), or have medicinal properties that can be troublesome if consumed in large enough quantities. Also, I would imagine that the taste of camphor wood barbequed food would be perhaps less than delicious. My recommendation is to not use it, not even for fireplaces, etc. I live in Bakersfield, California. I have one of these trees in my front yard and am very happy with it. So much so that were I not moving in the near future I would have seriously considered adding a second one. We have a desert climate here and this tree, once planted from an approx. two foot tall tree when I purchased it from a local nursery, was only watered occasionally each week for the first couple of years. It has since not received much for water at all and yet has done well as an established tree even through severe drought. Temperatures here can make it up to 115 degrees Fahrenheit in the summer for very few days, though most of the days in the summer reaching 100 F are roughly 30 days out of the year. Winters can see temps drop into the teens F on a rare occasion overnight with a rebound of as much as a 40F degree temp swing during the day. Normal winters might see upper 20’sF during the night for a handful of days. This tree has performed well with no damage seen due to the temperatures of the area. To date, none of the seeds dropped have ever germinated, but if they had the seedlings would have been mowed with the cutting of the grass and gone unnoticed. Keep in mind that the soil here is commonly a course sand. True to it’s nature, there are no insects willing to mess with it here and the only thing we had a problem with was several years ago a single gopher thought it’s roots would make a nice underground home. Allowing this tree to grow naturally works just fine, however, after it’s well settled in you might want to remove lower branches that interfere with walking around it. After they are removed you’re all set. Putting up with the lower branches at first will allow the tree to get a good foothold so don’t get anxious to remove the lower ones until the upper area is well established. I’m going to be moving soon into a higher elevation known as “High Desert” where the temperatures are a bit cooler. Given that the day versus night temp swings are also as dramatic, ranging as much as 20F on average and on extremes for an occasional day as much as 40F, I’m of the mind that it might handle the cooler overall temps there as well. Summers ranging up to 100F and winters dropping into the 20’s for some days and an occasional teens at night. Most winter days there are similar as to here in Bakersfield with lower temps normally running around the 40’sF and 30’sF during the winter months. It’ll be well worth the try since the tree provides excellent shade and is an evergreen thus keeping it’s great looks year-round.